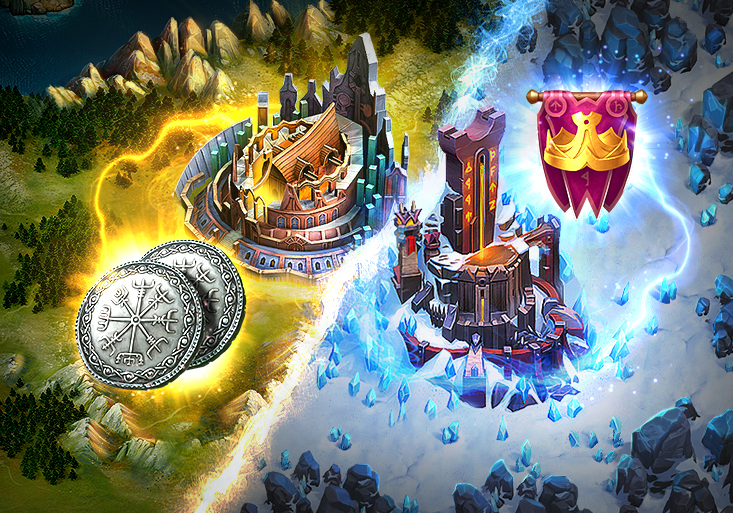 In Vikings: War of Clans, there are two Fortresses: the Throne of Jotunheim and the Place of Power. Capture these locations and get unique bonuses and valuable rewards! Of course, you'll need to deal with other Jarls' troops first. Capturing Fortresses is the pinnacle of a warlord's mastery. However, any Jarl can achieve it – we will now tell you everything you need to know. - Open – the Fortress is not occupied by anyone, or Guarded status has expired. - Siege – the location has been captured, the status is valid for 6 hours. During this period, the Fortress can be attacked by other Jarls. If an enemy attack is successful, the timer starts again. - Guarded – the troops managed to hold the Place of Power for 6 hours and capture it. Guarded status is valid for 24 hours. During this period, the Place of Power cannot be attacked. After 24 hours, Open status is set again, but the location owner remains the same until they are dislodged by enemy troops. You can only capture the Place of Power in your home Kingdom, and only if you are a Clan member. Jarls who are not members of a Clan or who have relocated to another Kingdom during a global Competition can also attack the Fortress. However, they won't be able to capture the location even if the battle is successful. If a Clan withstands a Siege, its Clan Chief becomes the Konung and every 24 hours receives 20,000 Prowess Points and 10% of the Silver of all Clan Chiefs in the Kingdom. The Konung also has the power to assign Reputes to any Jarl in the Kingdom. Reputes are active for 3 hours (if the Konung is not overthrown, of course) and give positive or negative bonuses. For example, they increase the speed of building or decrease specific troop stats. One Repute can't be given to several Jarls. After 3 hours, Reputes can be reassigned. Only the Konung and the Elders of the Clan holding the Place of Power can give Reputes. However, to do this they need to be in their home Kingdom. Your Hero's and Shaman's equipment bonuses will come in handy in the fight for Fortresses. For example, Ubba's Helmet and Scale increase troop offense, health, and defense when capturing and holding Fortresses. The Recluse's Mask and Northern Armor have the same effect. The Shamans boast a true expert in Onslaughts and battles for Fortresses among their number – Raine the Wanderer. Summon him and leave your enemy with no chance!